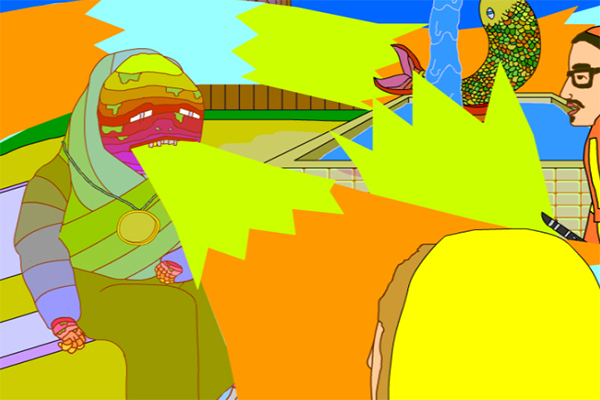 A hooliganship video performance from 2006 set in the style of a graphical adventure game. It debuted as a Hooliganship performance that combined cinematic projection with costumes and live music. In total I performed this work in dozens of venues including Monkeytown in Brooklyn, NY; The Portland Art Center in Portland, OR; and The Blue Barn Theater in Omaha, NE. The narrative follows Hooliganship as their band practice is cut short by a character named Donald Trumpet. A stream-of-consciousness adventure ensues that takes us deep into the mind of Mr Trumpet. Watch a standalone version of the video here.